En el barrio de Gracia tocando con la Diagonal se encuentra Tokyo Sushi Gracia, sin duda uno de los mejores restaurantes de comida japonesa que te puedes encontrar en la ciudad condal. No sólo por la variedad si no por la originalidad de los platos. Para poder disfrutar de una comida auténticamente nipona puedes comenzar con un Hiayako, que es un queso de soja frío o una Sopa de miso o quizás unos Pinchos de calamar con salsa de jengibre. Puedes vivir la maravillosa experiencia de que te cocinen en tu propia mesa la carne que te vayas a pedir, el famoso Sukiyake. También es un plato muy original el Cerdo rebozado con arroz y curry. ¿Y qué te parecería probar una Anguila ahumada sobre arroz? Todos estos platos y muchos más los tienes. Tokyo Sushi aúna perfectamente la tradición milenaria de la gastronomía japonesa con un trato exquisito, amable, delicado y simplemente perfecto. Si eres de paladar y gustos exigentes, este es tu sitio en Barcelona. No lo dudes y ¡haz ya tu reserva! The food was OK, nothing very creative or special, but pretty good for Barcelona standards. Quite good makis (pick the chef recommendations) and salmon sashimi,. Even after 30% discount we ate 4 people for 120€ w 2 bottles of standard white wine. Good service. We had an amazing dinner at Tokyo sushi! Great sushi, high quality and very good service. Higly recommended, I would definitely come back next time in Barcelona. really nice, enjoyed the ambient, food, worth price! Nice food, very nice setting, service, etc... recommended! 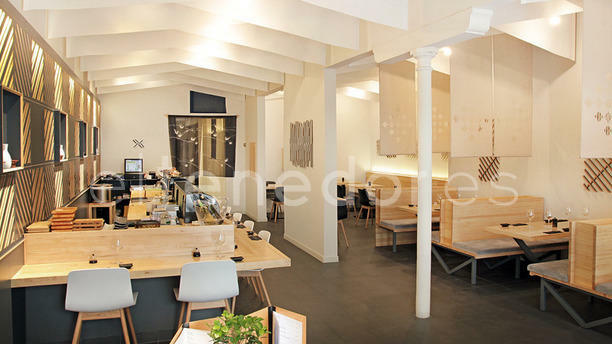 Nice Japanese restaurant located in Gracia. The setting was minimal but bright and with wood finishes so it still felt comfortable and inviting. The selection of food was excellent, we went with a variety of sushi rolls. I especially liked the flambéed salmon and asparagus rolls although the futomaki were a bit heavy on the philadelphia. The price was what you would expect for good quality sushi but we also selected a nice bottle of red wine and had a few beers to start. The staff were friendly and attentive. Over all it was a great experience and everyone enjoyed the night. The cuisine was excellent. The mood was fine but there was no music at all. The only weekness is the service. They only have two guys for nine tables. In spite of they did their best effort, they need another guy to help with the tables. Excellent new restaurant! The food has the true Japanese flavor, I recommend it to everyone, nice mood, design and service.